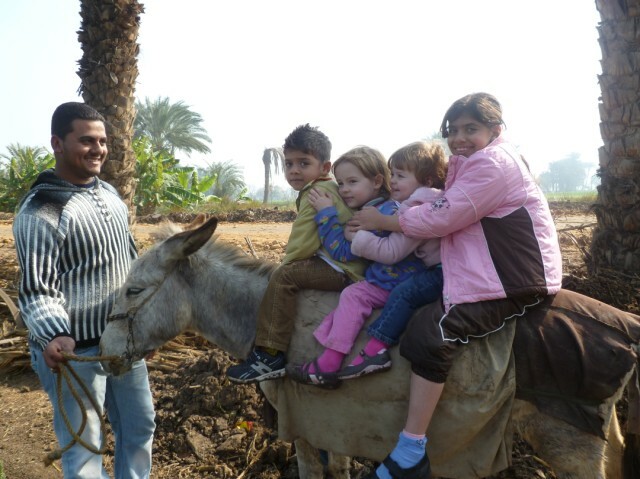 note: About a week before the revolution, our family took a trip to Maghagha in Upper Egypt. Whereas normally we would have liked to post about our experiences shortly after returning, events took a turn that did not allow much time for reflection. Two months later, Julie is finally able to share our experiences, with quite a few pictures as well. I am learning more and more that I am not a very flexible person. I like my schedule, knowing where I will be and what I will be doing, keeping my kids on a normal sleep schedule and having an idea of what is around the next bend. Sometimes, though, we all know that life isn’t dependable. This may be compounded by living in another culture, and is especially the case when we take trips out of Cairo. 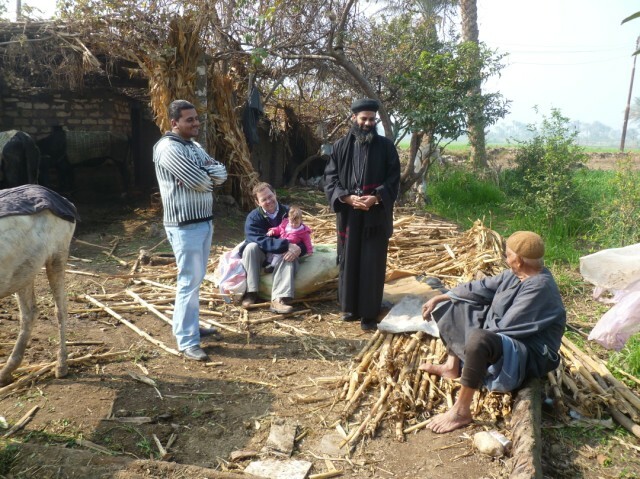 A year ago, during Coptic Christmas, we traveled for the first time to Upper Egypt, to the town of Maghagha, to stay with a priest’s family for four days. 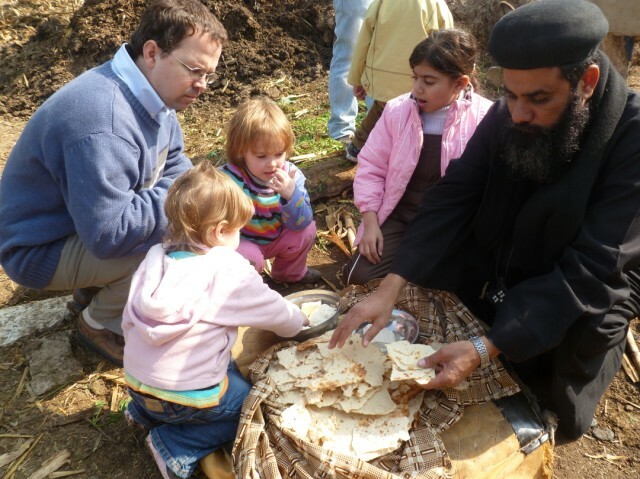 This priest is a friend of Jayson’s work, and he graciously offered to host us for an “out-of-Cairo” experience. 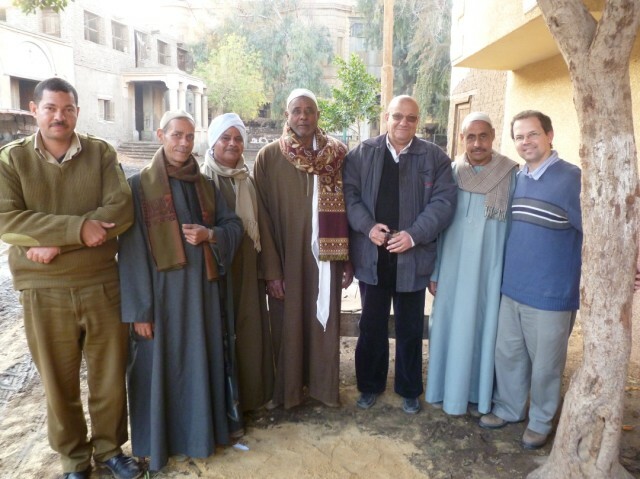 We learned a lot while there and really enjoyed getting to know his family, and as is always the case with such hospitable Egyptians, the invitation to return was put forth multiple times. 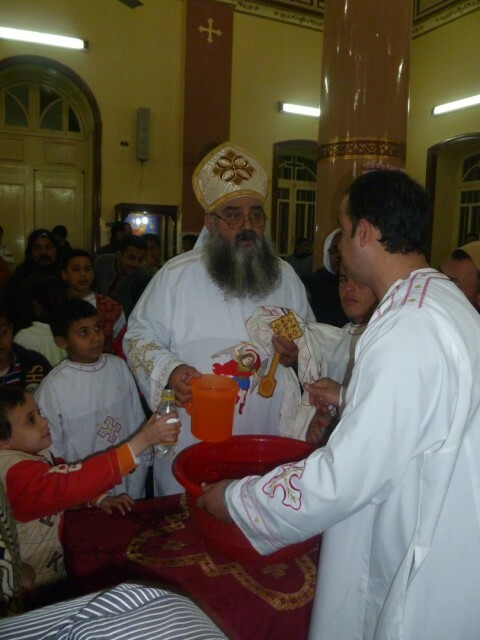 We finally had the chance to return last week for the Orthodox celebration of Jesus’ baptism, or eid il-ghataas. Since we visited many of the Holy Family sites last year (parts one, two, and three), I imagined that this visit would be more casual and relaxed. 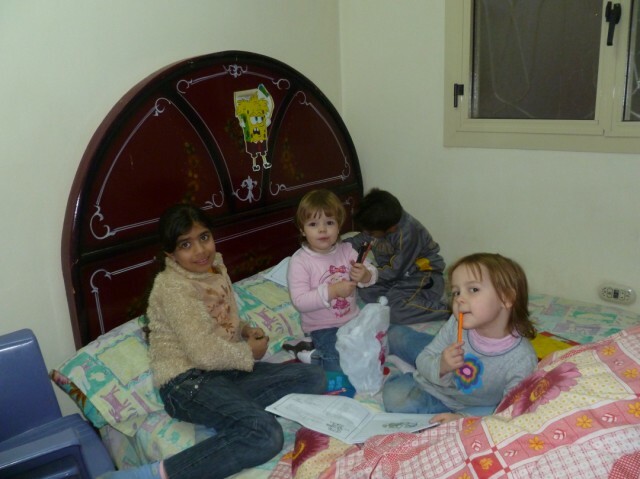 I thought that while Jayson might go out and about with the priest, the girls and I would hang out at the house, talking with the women and learning more about their lives in this Upper Egyptian city. However, I was in for three surprises. The first one came as soon as we arrived. The train ride was fairly uneventful, but our seven-month old Layla, was definitely ready for a nap by the time we pulled into the station. I was keeping her awake imagining we would be at their home soon so I could set up her crib, and she could get a normal nap while we got reacquainted with the family. Instead, as we were loading the car, Jayson informed me we would be going directly to the village, about 20 minutes away, where the priest’s church is. I deduced this meant we would spend the whole day there, including the four-hour service at night which ends at midnight. I was not a happy camper on the ride to the village! I was right about spending the entire day and half the night at the church, and there were some periods of stress while there, but all in all, it was not so bad. Layla napped in the car and later on the floor of a reception room we had to ourselves for the day. We tried to get Emma and Hannah to nap while watching a movie, but the electricity went off and the movie stopped working. However, they were fairly content to wander around the church grounds, mingling some with the people there, coloring, exploring the church and checking in on Daddy as he talked to various people. We had an opportunity to visit the mayor of the village’s sister’s house which was a very interesting building to see, and even observed something new at the mass that evening. There was an added element of water to commemorate Jesus’ baptism. The priest went around with a towel soaked in the water and touched each congregant’s head with it. The bottles were taken home by people to use and mix in their normal consumption. Layla slept almost the whole service, and Hannah slept about half the time. Despite being about the opposite of what I had expected that day, it didn’t turn out so bad. The night was a little challenging as we returned to the priest’s house around 11:00pm and after greeting the family members, I got the room and crib ready for sleeping as quickly as I could. Layla transferred to her crib well, but really struggled with sleep for several hours, and ended up sleeping in our bed to give me some shut-eye, and not wake up the rest of the house. Emma and Hannah joined us for the midnight meal before they went to bed and actually slept well. It was great seeing this family again, and meeting the newest member, one-month old grandson, Jason. The mom informed us they named the boy after my husband. After a leisurely morning, we drove to another priest’s house to spend some time with his family of four. We had a meal with them during our visit last year, and planned to do the same this time. Just before our host priest dropped us off, however, he mentioned he would be going to the local hospital for some tests on his heart. He then planned to pick us up and take the girls and I back to hang out at his home while he and Jayson saw some more sites. I was very happy with this arrangement as I was hoping to give Layla a normal day so that we could all have a normal night. I figured we would be at visiting the second priest’s family for about 4 hours, leaving us plenty of time to get all three girls in bed much closer to their 7pm bedtime. However, such perfectly laid plans were not to be. We had a good time with the family as we visited with his wife, two children, and some extended relatives. They were typically hospitable serving us tea upon our arrival and again about an hour later, followed by a delicious meal that was more than we could eat, after which we had bananas, oranges and more tea. Meanwhile, the kids were having a great time together once our girls warmed up. It was fun watching Emma speak with the kids in Arabic and really be able to communicate together with them. I was glad they were enjoying themselves, and it freed me to be with Layla and also visit with the family members. After about five hours, I started getting a little uptight. I wondered what happened to the priest and why he wasn’t calling to come pick us up. I’m sad to say that he wasn’t my main concern, but the clock was ticking and I really wanted to get Layla in her bed early. Around 6:30 or so, he called and informed us that he would travel to Cairo the next day for a heart procedure so we should stay with the other priest for the night. Once again, my main concern was for my own little family as I realized that this restless baby would not be in her bed anytime soon! I thought also of the priest, and was concerned for his health, but my face gave away my frustration at this surprise number two. By the time we would get our things from the other house and move them here, it would be well past the normal bedtime. Unfortunately, our new hosts read my face and asked if I was unhappy to stay with them. I tried to explain that I was very happy to stay with them, but I just needed to get my kids in bed. It sounded hollow, and I felt bad to have offended them. 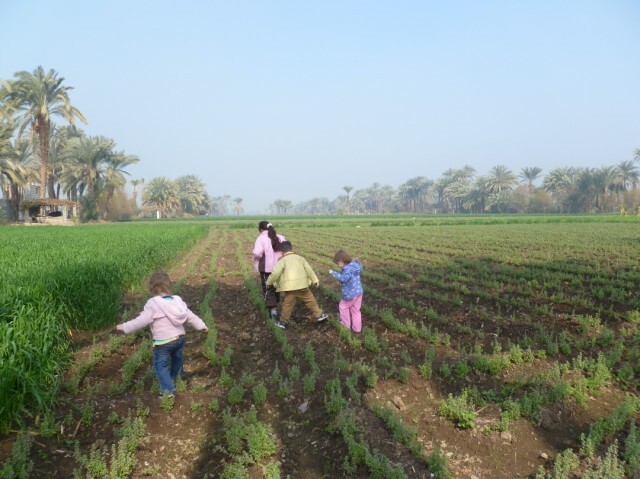 For one, most Egyptians think our child-rearing methods are very strange, particularly in the way we feed the kids, and the way they sleep so early. So they couldn’t understand my concern about the hour, after all, it was only 7pm – not late at all! Secondly, earlier they had mentioned how they wanted us to stay with them on our next visit, and so they were very excited about hosting us, even though it was a surprise to them too. To see my visible disappointment was probably quite hurtful. And once again, this surprise turned out to be better than expected. Layla did not get into her own bed by 7pm, but at this apartment, the bedrooms were set in the back of the house, away from the living room. The other apartment was difficult for sleeping because the living room, with all of its noise and light, was just a doorway away from my children who were supposed to be sleeping. Also, while we really enjoyed our original host’s family, he didn’t have any young kids. This house came complete with a nine-year old girl and five-year-old boy, and my two girls played happily with them for the next 24 hours. We all slept better that night, and got some decent rest for the third surprise the next day. The plan the next day was to visit the younger priest’s father in a nearby village. This sounded like a nice idea, and through conversation I discovered that even though he is in his 80s, he still farms his fields every day. Jayson told me we would visit him on the farm, and for some reason, I pictured a nice farmhouse to sit in while the girls ran through the fields. What a nice treat after living in the city. When we arrived at the priest’s father’s plot of land, I realized I was right in half of my thinking. We were surrounded by green fields in every direction—a site for sore eyes coming from the smog of Cairo. But the surprise was that there was no farmhouse to speak of. Instead there was a small stone structure built on his land, but the house where he slept at night was a distance away. So, we had a very casual visit, sitting on bamboo sticks, a log, a white folding chair and a large cloth bag. Fortunately I had brought Layla’s car seat so she could be contained in a clean place. But feeding her and trying to encourage the girls not to step in any animal droppings, and then wondering just how long we would be visiting here as Layla’s naptime came and she started to cry heightened my frustrations. And yet once again, there is a bright side to all of this. Our girls did enjoy walking through the fields with their friends. 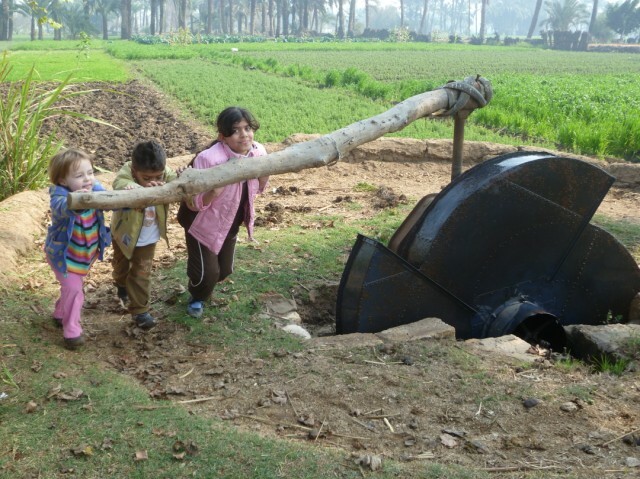 Emma saw a water wheel that irrigates the land. All four kids rode on a donkey. Jayson got to learn more about a village farmer’s life from the 80 year old man. And for some reason, Layla fell asleep on my shoulder—something that rarely ever happens. We got to breathe some fresh air and bask in the green of the land. 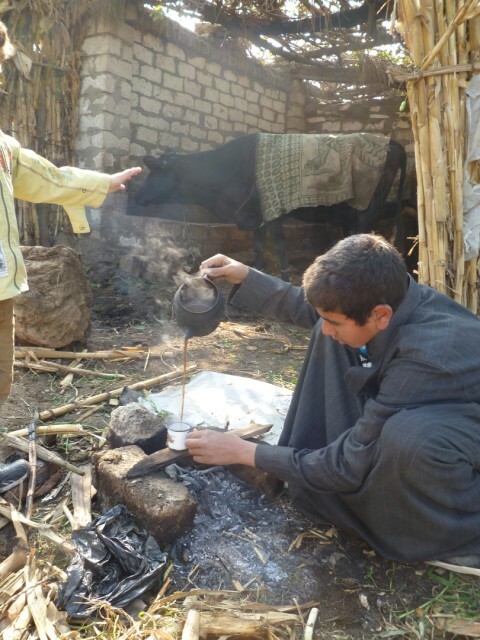 And in typical Egyptian fashion, we were even served tea, cooked over a fire, as well as bread with cheese. You just can’t beat Egyptian hospitality. In some ways, it was a trying and tiring trip, mainly as I was concerned with the behavior and schedules of our three little ones. But overall, the girls did well being flexible with eating and sleeping, and got to have some new experiences. As for me, looking back has helped me see the good things that come with surprises, and will help me remember in the future to be a little more flexible, and expect great things.